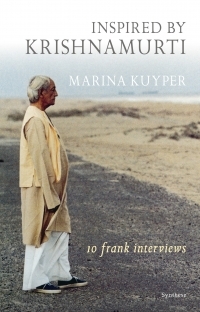 Her experience with qualitative investigation inspired Marina Kuyper to interview people about questions such as what is it that made them go into the work of Krishnamurti for so long and so intensely? What could these people tell about the insights they got from this? What implications has this inquiry had in their daily lives? Ten conversations were held with people from England, Switzerland, The Netherlands, India, Thailand, New Zealand and Spain. They have very different backgrounds and have all been intensely involved for many years with Krishnamurti´s way of thinking. Among them are a former professional footballer, a psychotherapist, a physicist, a cook, a teacher and an author. Some of those interviewed have lived for years in close proximity to Krishnamurti. They speak very openly and in an easily accessible way about what Krishnamurti has meant to them. Each of them stresses a different facet or a different essence. The interviews also bring out in concrete terms how this approach can manifest in one’s life. For all those interviewed the consequences have been far-reaching. Jiddu Krishnamurti (1895-1986) can be counted among the most original and radical thinkers of the twentieth century. Until shortly before his death he travelled the world giving talks with the sole intention of making people wholly and unconditionally free.